Rev. 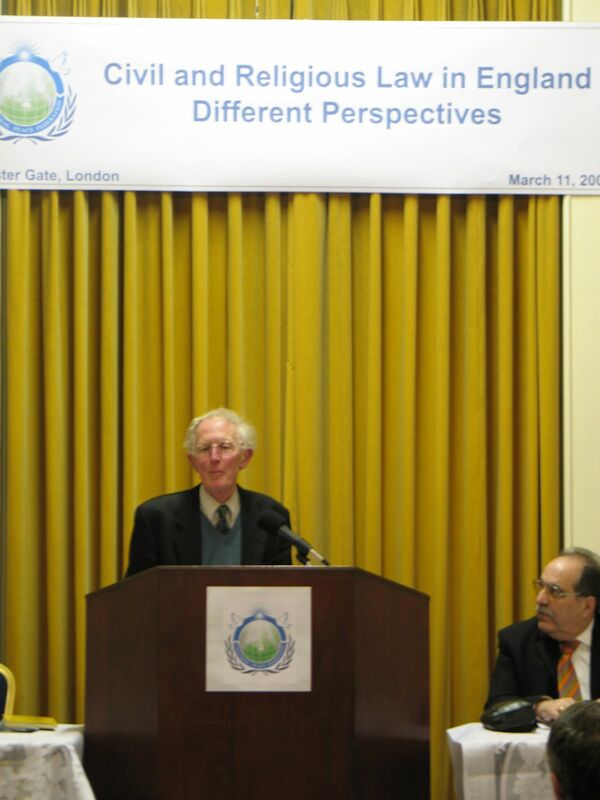 Dr. Marcus Braybrooke emphasised that most people of faith believe that God’s laws have primacy over civil laws. He posed the question whether our faiths measure up to the universal values that are grounded in our belief in God and that are to be found with more or less clarity in all our faith traditions. These universal values were sought in the 1993 Parliament of World Religion’s four irrevocable directives and in the book Stepping Stones to a Global Ethic. These Directives include a commitment to a culture of non-violence and to respect for human life, commitment to a culture of solidarity for a just economic order, commitment to a culture of tolerance and a life of truthfulness, commitment to a culture of equal rights and partnership between men and women. Interfaith activity involves a call for better interfaith relations and for internal reform. The interfaith movement needs to examine our own faiths’ practices to ensure that we live up to our professed standards. Those involved in fundamentalist extremism, bigotry or persecution of other faiths usually do not have an experience of the living God. We must commend the shared moral values that we hold together that derive from our belief in God. Rather than battling for special exceptions for our own faith we should seek together to find democratic means to ensure that the laws of the land reflect the universal values that we hold in our respective faiths. Rev. Braybrooke quoted the Acts of the Apostles (4,19) where Peter and John, saying that obedience to God’s should come first - before the civil laws of the State. Most people of faith would agree that God’s law has primacy. Many holy people have been martyred trying to uphold that standard. The International Court of the Hague also does not accept obeying orders as a defence for the violation of human rights. Although it is said that human rights emerged from the enlightenment the concept of human rights is accepted within our religious traditions although not expressed in that way. (See Stepping Stones to a Global Ethic, ed Marcus Braybrooke). Today many religious leaders are affirming the moral values shared by the faiths. The declaration 'Toward a Global Ethic' was formulated in 1993 during the ‘Parliament of World Religions’. Four ‘irrevocable directives’ are mentioned in the search for Global Ethics, or four basic moral commitments: the commitment to a culture of non-violence and to respect for human life, commitment to a culture of solidarity for a just economic order, commitment to a culture of tolerance and a life of truthfulness, commitment to a culture of equal rights and partnership between men and women. We need to ask whether our faiths measure up to the universal values that are grounded in our belief in God and that are to be found with more of less clarity in all our faith traditions. Together we should challenge any society that falls short of these values. For example, in my view, Capital punishment, torture and terrorism are a denial of our God given rights. Certain things are wrong wherever they are practised. In the treatment of women female circumcision and forced marriage etc are also wrong. British law has continued to adapt itself. People can now swear on any of the Holy Scriptures. Firms should allow workers to observe their holy days. The Archbishop of Canterbury was right to suggest that there should be further accommodation of Muslim concerns within British law. There will be tensions such as how far should people be able to opt out of British law. Sikhs are now allowed to not wear crash helmets. Catholic adoption agencies are compelled to serve gay couples as well as heterosexual couples. The issue of conscientious objectors was a hot issue in the beginning of the 20th century. It is sad that instead of trying to find compromises in these situations we seem to us them to exaggerate our differences. The reactions to the Archbishop of Canterbury’s speech showed the fear there is in Britain of the Muslim community. This is unfair to the great majority of Muslim believers. This was the worrying aspect of the reaction to the speech. There is a minority of Muslims who desire to convert Britain to Islam just as there were campaigners who wanted to win the world for Christ in our generation in the 1920’s. The majority of Muslim believers just want to live their lives here and practice their faith. The undercurrent of suspicion of fear that has been exposed has placed a grave responsibility on those involved in interfaith work to help the communities to understand each other. They must especially avoid the practice of second hand teachings and attempt to obtain the genuine faith statement and tradition from a first hand source. Christians that are anti-Semitic are often those who do not attend church but only remember what they learned in Sunday School a long time ago. The more extreme members of the Muslim faith also rely not on their genuine experience of the living God but rely upon others interpretations of the scriptures. Interfaith is always a call for better interfaith relations and for internal reform. The interfaith movement needs to examine our own faiths’ practices to ensure that we live up to our professed standards. We must commend the shared moral values that we hold together that derive from our belief in God. Rather than battling for special exceptions for our own faith we should seek together to find democratic means to ensure that the laws of the land reflect the universal values that we hold in our respective faiths.